Even as I begin typing tonight, my fingers still feel the lingering frostiness of ice. It’s ironic, actually. My heart is melting. It’s been a deeply heartfelt and fully lived day, and I have felt the urge to write for the first time in a couple weeks. My muse apparently needed a nap, although I knew that she’d return at some point. The day has been lovely, but long. I just finished answering my email and setting up for tomorrow’s meetings. I thought, “I should write…” but lacked a starting point at which to delve into this day that has been filled-to-overflowing. As I sometimes do, I offered up a little prayer, opening my heart to whatever words may choose to find me. Then, I flipped open my laptop and promptly knocked over my glass of ice water, sending cubes of ice scurrying all over my floor. I started my day setting up for food pantry in my church. If ever there are moments when I question human kindness, serving at pantry melts it away. Today, I was scooping ice from our ice machine into drink pitchers when one of our sweetest volunteers came in. I gave her a hug as she asked permission to stay and work, even though she was supposed to be there picking up food. There was not a question in my mind as I said, “Of course…you can do both!” and she smiled ear to ear. She went on to ask me to pray for her; earlier this week her boyfriend had died in their home, lying beside her. I listened to her story and realized how raw and fragile this person was standing before me, who was filled with both overwhelming strength and deep need. “I need to be somewhere happy” she said, “and being here makes me happy.” I completely understood. She took the pitchers of ice out to the table, and began to serve those who were mingling around the coffee, lemonade, and pastries that we were setting out for the morning. She came back to find me a few minutes later, in tears. Her necklace had broken, the silver heart pendant bouncing across the floor as the thin chain snapped in half. That was the necklace her boyfriend had given her on Valentine’s day, she explained. She never wanted it to leave her, and there it was in pieces. I told her not to worry; we could fix this particular brokenness. For me, the entire full motion of the pantry stopped as I began searching for something to make a necklace. I enlisted the help of my friend and parish administrator Ruth, going through lost and found buckets and trying to find a replacement. No success. Suddenly, it hit me like a flash, and I made my way upstairs to the prayer-bead making supplies that I’d stored there after the Fall parish retreat. I scooped them up, ran back downstairs to the pantry and wrapped my arm around her to bring her back into the kitchen with me. She selected the bead twine that she liked the best, and we made up a new necklace for her treasured heart. Another hug, and she was off spreading her warmth of service to those waiting their turns for food. Later in this day…after hours of supervision, teaching, learning, dialogues of faith and justice, parenting, partnering, cooking, planning, connecting…I walked into the basement of one of the local charities closest to my heart. I was celebrating a new beginning of employment there for a colleague, and recognizing forty-something years of revolutionary service that Fan Free Clinic has provided in our community. In the room with me were colleagues…current and retired…friends, former students, friends of friends, and so many of those who knew me in ways both personal and professional. I was overwhelmed by my own sense of connection. One of the leadership staff walked up to me; it had been years since we last saw each other. It may have even been at one of the memorials for Laird, who had been his colleague before the visit of untimely death impacted all of our lives. He hugged me, because shared memory forges friendships that transcend time and distance. He looked me in the eyes and said, “You know, I still have Laird’s name tag on the bulletin board in my office.” I smiled. I hadn’t known until that very moment just how much I needed to hear that. I told him how much I still miss Laird; he was not just family to me…but friend and colleague, too. We sat together, sipping our well-iced beverages and solving the problems of social service delivery several times over at every family gathering while others talked on about whatever else was happening. It was an unexpected gift; this moment of memory emerging even though I had gone to this gathering to celebrate someone and something else. As I was driving home, I thought of the time that has passed for me here during my eight years in Virginia. I thought about the amazing community that surrounds me in my work, my faith community, and in my entire life. I have lived and loved and lost and grieved here. It is such a gift to be known and loved, both in our shared gifts and our shared grief. There is no gift more human, and no gift more divine. 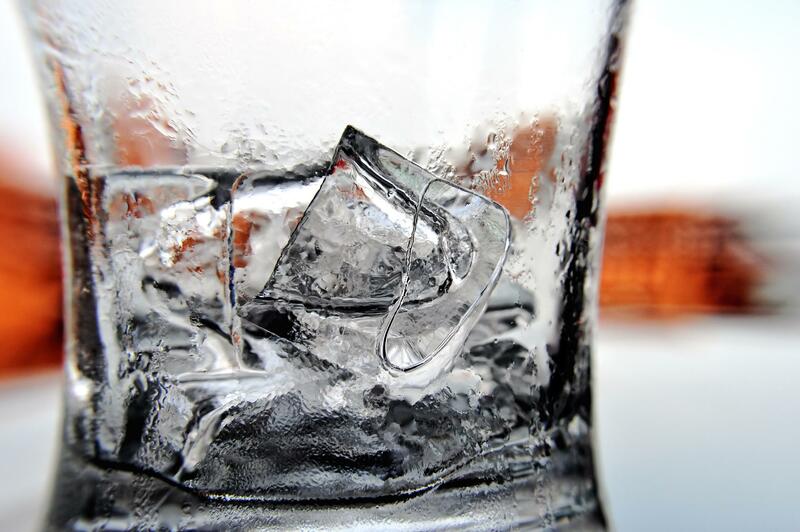 I look at my glass, filled newly to the brim with fresh ice. I had enough lurking in my freezer for a second glass. I think about the day, the melting of love against the coldness of life in so many ways. What we think we have sometimes slips away more quickly than we would like. What we receive from others replenishes us, and in our own giving we abundantly receive. You can never have too much ice. This entry was posted in work and life and tagged daily ordinary, Death, faith, family, gratitude, Grief, ice, life, living, love, memoir, memory, remembering, remembrance, service, serving, story. Bookmark the permalink. ohhh, love this so much Sarah. You are a beautiful writer.